So pleased that one of the world’s top players, Michihito Kageyama will be participating in the tournament. 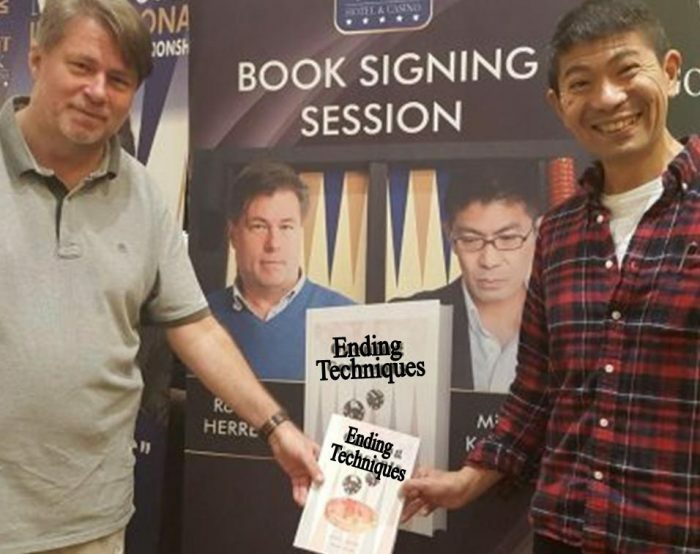 Special event to be held at the casino in conjunction with a launch and signing of Michihito and Roland’s new book. Endgame Techniques. Michi will present a fun seminar and a short quiz based on the contents of the new book. Winner of the quiz will receive a personally signed copy of the new book. Entry to the quiz will be £5. All guests can attend seminar and enter quiz just for fun without paying if preferred. As an extra bonus there will be pre-sold raffle tickets @ £15 each which will include the quiz entry and the chance of winning Michi as doubles partner including entry fees. Raffle draw will be held @ 3pm on Saturday before the draw for doubles. If you have already entered the doubles you will be refunded and your proposed partner will need to find someone else to play with if necessary. available to purchase and have signed by the Author(s). Entry fee for Michi and his partner (winner of raffle) will be fully paid, any winnings will be split equally between partners.